The new Kindle Fire HD has just been presented in Santa Monica. But the Kindle Fire gets a makeover. The new Kindle Fire HD will be released in 2 versions, one as well as a 7 inch and 8.9-inch tablet. The new Kindle Fire HD comes with dual-core processor, full HD display with 1920 × 1200 pixels resolution (254dpi), 1GB of RAM and 16GB of internal storage. 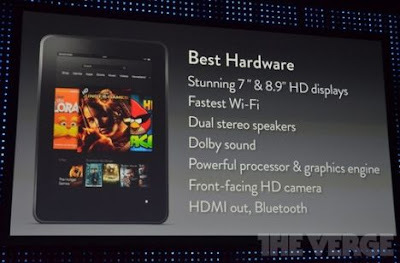 The new Amazon Kindle Fire HD shines so with impressive hardware specifics functions. To come on the market, the 8.9-inch model from 20 September for U.S. $ 299.00. The 7-inch model comes for U.S. $ 199.00 and with the LTE Kindle Fire HD with 32GB memory for U.S. $ 499.00. Unfortunately, Europe is not mentioned again as a sale, maybe even remembers here at Amazon's new Kindle Fire have a better HD. But not only the new Kindle Fire HD shines, no, Amazon Kindle Fire also has the predecessor donated a new interior. Now, here comes a new processor, 1GB of RAM and probably a stronger battery used. And best of all, Amazon has lowered the price of the Kindle Fire at U.S. $ 159.00, so it is U.S. $ 40.00 cheaper than before. But also on the software of the new Amazon Kindle Fire HD has once again worked vigorously. Now has its own Facebook app is offered, and Skype contact and were integrated for the Kindle Fire HD, there is a new e-mail software. The Whispersync service was extended, now it is possible, Scores to sync online. All in all, Amazon seems to have succeeded with the new Kindle Fire HD a winner. [Update] The Kindle Fire HD is now available for preorder at Amazon Germany from EUR 199,00!